Mr Turnbull Responds…. NBN Investments and Pecuniary Interests…. In a rather interesting turn of events, it seems that my last post in regards to The Turnbulls and their investments in NBN contractors has attracted a wee bit of attention, while also touching a few nerves. 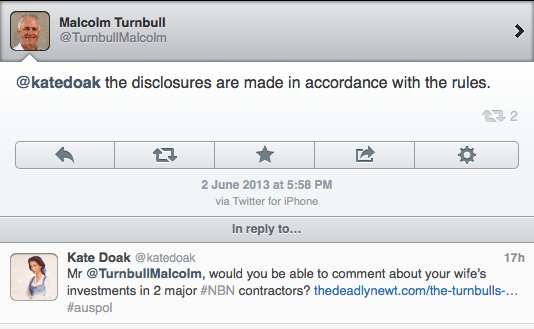 Soon after I published yesterday’s post, the following exchange took place between Mr Turnbull and myself on Twitter. Now thanks to Katharine Murphy at “The Guardian Australia”, it has come to my attention that Mr Turnbull and his staffers have stated that they would like to dispute what I reported about yesterday. As they would recollect however, I stated at the time that The Turnbulls had disposed of the Siemens shares (in late 2011), while the Hochtief AG shares were still in Mrs Turnbull’s possession according to what I could see from Mr Turnbull’s pecuniary Interests Register. After reviewing Mr Turnbull’s Register of Interests again this morning just to be 100% sure, this is a statement that I’m standing by. Now while Mrs Turnbull disposed of the Siemens shares, the fact that this was within a year after Siemens had two of their joint-partner subsidiaries (Silcar Communications and Nokia Siemens Networks) receive rather large contracts with the NBN highlights a few problems with the rules of the current Pecuniary Interests register system. Given that Siemen’s share prices rose substantially throughout most of 2010 and 2011, it would be interesting to see when exactly Mrs Turnbull sold those particular shares, as well as what price and quantity. This in turn raises a weakness within the current Pecuniary Interests Register system, as share sale prices, share sale dates, share quantities, company activities and subsidiaries aren’t required to be listed within the submissions of our current politicians. Were the shares sold while the shares were on a high, or were they sold when Siemen’s shares decreased in value later that year? Needless to say, these are questions that the Pecuniary Interests Register can’t answer sufficiently in its current form, though should be answered given Mr Turnbull’s responsibilities. Furthermore as we’ve recently seen with the Obeid and Torbay scandals in New South Wales, Pecuniary Interest Registers more often than not don’t take into consideration the land and property characteristics of various investments, which in turn can have a significant impact on the way that these investments influence various politicians. Given what’s unfolded with the Craig Thomson and HSU affair, it isn’t unreasonable to challenge politicians in regards to their financial and business activities, as long as such information comes directly from a public register, such as the House and Senate Pecuniary Registers. Needless to say, without an independent investigative commission it falls to journalists and the Standing Committee on Privileges and Members Interests and it’s corresponding committee in the Senate to investigate irregularities within a federal politicians pecuniary interests, while there’s little to no examination of their staffers. This was a topic that I asked The Hon. Former Deputy Prime Minister John Anderson and Senator Barnaby Joyce about at the recent Nationals preselection for the Federal Division of New England, however understandably this is an area that would need extensive bipartisan discussion before such an independent commission of inquiry were permenantly introduced, as we’ve seen within the states. So given that this information has been supplied directly from official public registers and governmental websites, I can’t help but feel that the concerns of Mr Turnbull and his office havein regards to my article, are in regards to my references towards the Fibre To The Node system that Mr Turnbull has proposed for the NBNco to design its broadband network around. Given that Mr Turnbull has admitted that most of the propsed 50,000 new Fibre-Nodes would be located in apartment basements and other buildings, it is evident that my statement about new copper phone lines being needed to be laid under a FTTN system is more than likely correct. Furthermore, Mr Turnbull’s FTTN policy also states that FTTN can be upgraded to Fibre To The Home in the future. Given that it would be extremely difficult for the NBN to use the current copper phone line system (as they run to existing phone exchanges and DSLAMs rather than to convenient nodes), this would mean that new copper lines would be laid, only to be discarded when the system is upgraded to FTTH down the track. Needless to say, that would mean a lot of extra work for contractors such as Silcar Communications (which Hochtief AG and Siemens AG have interests in) and Nokia-Siemens-Networks in the future, at a considerable extra rollout cost. Now I must also state that the responses of Mr Turnbull and his staff have also given me the opportunity to examine some of the other companies that The Turnbulls have had interests in throughout the current parliament. This includes Melbourne IT (ASX: MLB — which both Turnbulls own shares in), New World Energy Ltd (Mrs Turnbull – Geothermal energy generation) and two properties in the Hunter Valley (Mr Turnbull). While Mrs Turnbull possessed her shares directly, Mr Turnbull possesses both the East Rossgole and Scotts Creek properties as well as his Melbourne IT shares via his personal company, Wilcrow Pty Ltd. While Melbourne IT is one of the lagest Domain Name providers in the world, according to NSW Govt studies the Scotts Creek and Rossgole areas of the Hunter Valley look to possess Coal Seam Gas deposits and potentially other minerals. As well as this, the Upper Hunter region of New South Wales also possesses some of Australia’s prime agricultural land for cattle and sheep, which undoubtedly would’ve played a major role in encouraging Mr Turnbull to purchase these properties from deeply respectful lifestyle perspective. As an olive branch to Mr Turnbull though, I’ll also take this opportunity to state that he isn’t the only politician that I’ve been investigating the pecuniary interests of. Needless to say, there are discrepancies (some of which are quite major) within the pecuniary interests of numerous other politicians within the current Australian Parliament, on all sides of politics. I’m not out to get anyone as a part of these stories, however the information that I’ve uncovered merits further investigation going forward. As a journalist, I would be doing my readers, audience and profession a disservice if I did not. Furthermore, I invite Mr Turnbull to pen an article on this if he believes that I’ve misrepresented him in any way, which I would be happy to publish. As Peter Phelps MLC (NSW Liberals) can attest, I’m more than happy to give people a right of reply and acknowledge any corrections that need to be made, if necessary.